The Heliocentrics are unofficially led by the British drummer Malcom Catto who toured with DJ Shadow and was a member of the alternative rock group The Perfect Disaster. Out There (2007), the title of their debut album, already hinted towards their extraordinariness. The record carries a familiarity of a mid-seventies production but feels experimental at the same time because of the use of some Eurasian and African arrangements. The latter predilection continued on the following two albums which were in fact one-time collaborations. Patriarch of Ethio-jazz, Mulatu Astatke was the first to collaborate with the band. In 2009 they released the highly listenable Inspiration Information in which Western jazz-funk was fused with traditional Ethiopian instrumentation. For The Heliocrentrics this release can been seen as a milestone because it earned worldwide acclaim for its innovative musical xenogamy. After this they hooked up with Persian music scholar Lloyd Miller (2010). Although still inventive, the ‘Dr. Miller album’ is above all a thoughtful effort to put the musically rich Orient on the map. From a scientific perspective this work is easily connected to the concept of Orientalism coming from Edward Said. Sometimes I question if this album unwittingly contributes to the static and stereotypical images of the Middle East and beyond. To me this is a legitimate question to bear in mind. Yet I also strongly believe that the colorful input of The Heliocentrics and the expertise of Miller counters this negative image by creating something completely new with a profound respect for prior eras. Anyway, this year the band decided it was time to stand on their own feet again. Six years after the debut their sophomore album 13 Degrees of Reality was released. 13 Degrees of Reality contains twenty-one tracks. Eight of those tracks are not really tracks in the narrow sense of the word, but serve as interludes. When leaving out these short breaks the album has a playing time of about 45 minutes. Remarkably the album starts off with the rendering of some political statements that clearly are derived from an Occidental view. Hereafter the band directly builds up a disorienting suspense in the form of dub sounds that are nervously combined with a set of brass instruments. Almost unnoticed the next track ‘Ethnicity’ debouches into the well-known exotica of The Heliocentrics. Though now the atmosphere is still centered around lingering tensions. From here dark mysticism is definitively perfected by fusing the prior exotics and tensions. In ‘Descarga Electronica’ the percussion and the present surf guitar clearly refer to those sultry Caribbean summers, whilst ‘Eastern Begena’ and ‘Black Sky’ takes us back to the sensual Orient of Lloyd Miller and the African traditions of Mulatu Astatke. ‘Collateral Damage’ sets the mood with a few anxious strings that are followed by playful flute play. Ethnic fusion is however sometimes put aside by the means of tracks such as ‘Mysterious Ways’ and ‘Freeness Part 2’. In-depth asymmetrical rhythms and free improv are highly predominant during these works. ‘Wrecking Ball’, ‘Calabash’ and ‘Mr. Owusu, I Presume’ are probably the most notable tracks on this new record. The first two are built upon the foundations of acid-funk and have a hypnotic edge to it. The latter contains a brilliant dusty groove that is completed by an organ and some futuristic sounds. So where does 13 Degrees of Reality eventually lead us in the end? 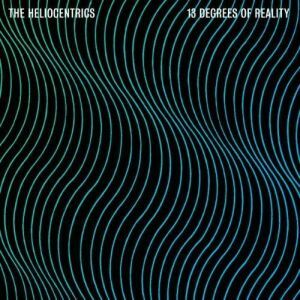 In the past few years The Heliocentrics expanded their musical knowledge of the world. Even more important is the fact that this new release shows their ability to valorize this knowledge. Hence one might say that this work is a logical continuation of their prior releases. Listeners who are not yet acquainted with this ensemble will understandably feel lost when hearing this album for the first time. To be honest, I suspect people who are acquainted with this band will also get lost because there is no clear focal point. To those I would recommend to step out of the box for a moment. Because once you’re out there 13 Degrees of Reality will make sense. The mysticism merely serves as a tool for musical boundaries to be blurred and reshaped. By doing so, this second record is an enchanting and fascinating synthesis and indeed takes us to new places. Let us hope more musical realities are still there to be created. A task The Heliocentrics surely will be able to handle. This entry was posted in WRM and tagged 13 Degrees of Reality, Afrofuturist, Avant-garde, DJ Shadow, Edward Said, Electronics, Ethio-jazz, Ethnic fusion, Ethnic traditions, Free improv, Free improvisation, funk, Fusion, Hip hop, Inspiration Information, Jazz, Jazz-Funk, Lloyd Miller, Malcom Catto, Mulatu Astatke, Music, Orientalism, Piccadilly Records, psychedelics, review, Sun Ra, The Heliocentrics. Bookmark the permalink.